This cake was created by Carlo’s Bakery, the shop made famous on Cake Boss. 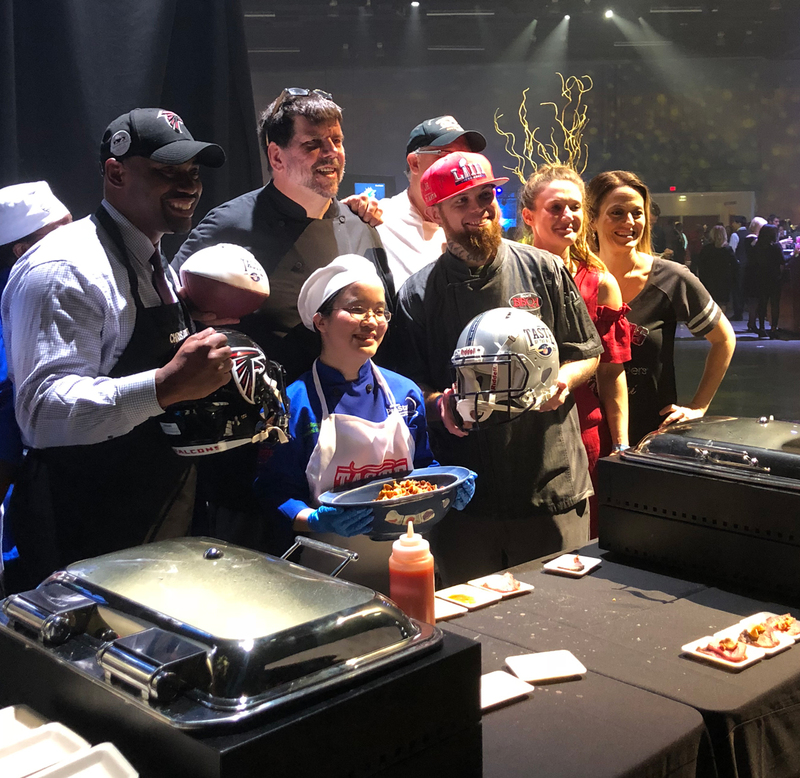 While most of Atlanta’s major Super Bowl events took place within a stone’s throw of Mercedes-Benz Stadium, on Saturday night, a couple thousand took the drive up to the Cobb Galleria Centre to sample dishes from across the country and raise money for an important cause. 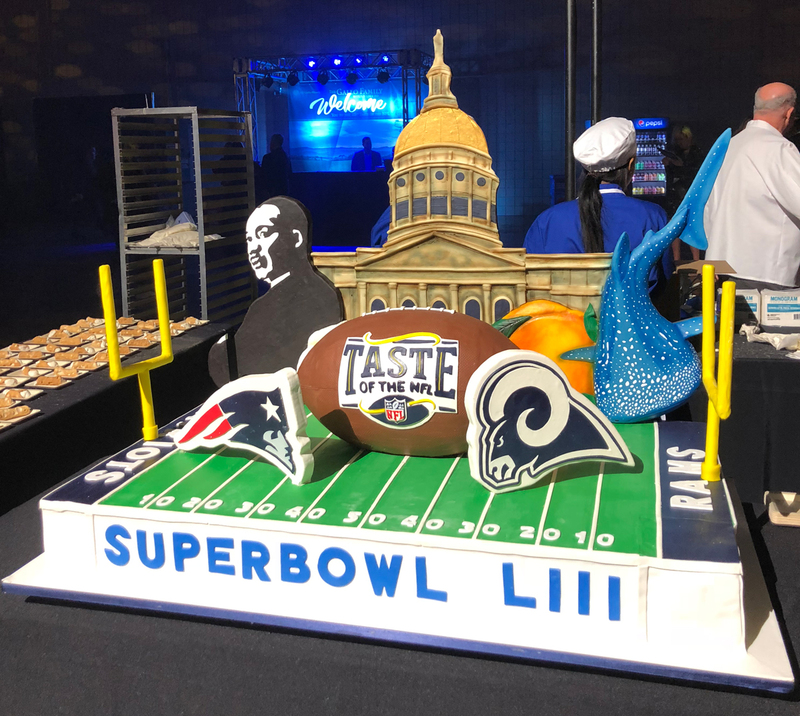 Founded by Wayne Kostroski in 1992 for Super Bowl XXVI, Taste of the NFL is traditionally held on the Saturday night before the Super Bowl in the host city. 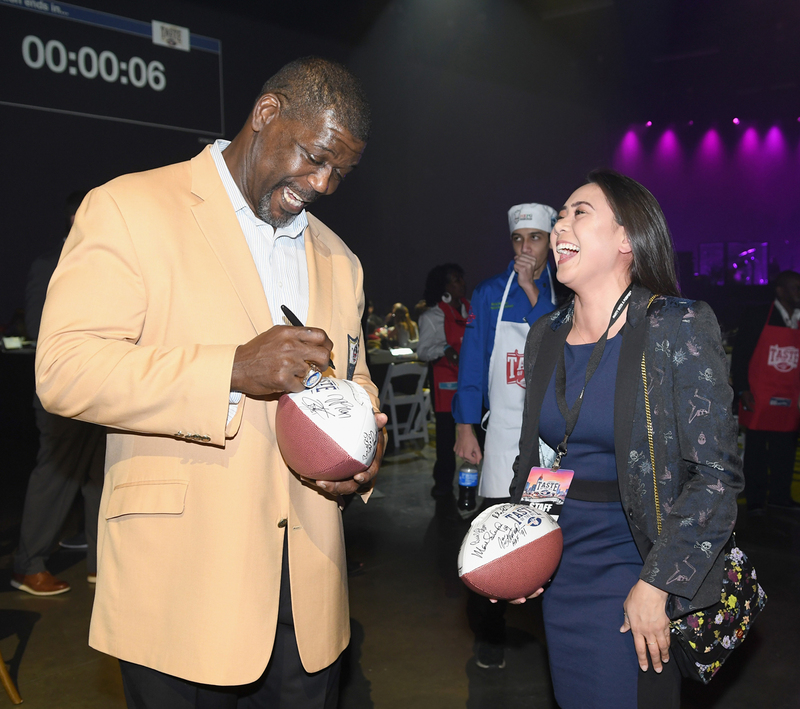 Nicknamed the “party with a purpose,” the event brings in a chef to represent each of the 32 NFL teams, as well as a “player rep” for each team—former players, many of whom are Pro Football Hall-of-Famers. 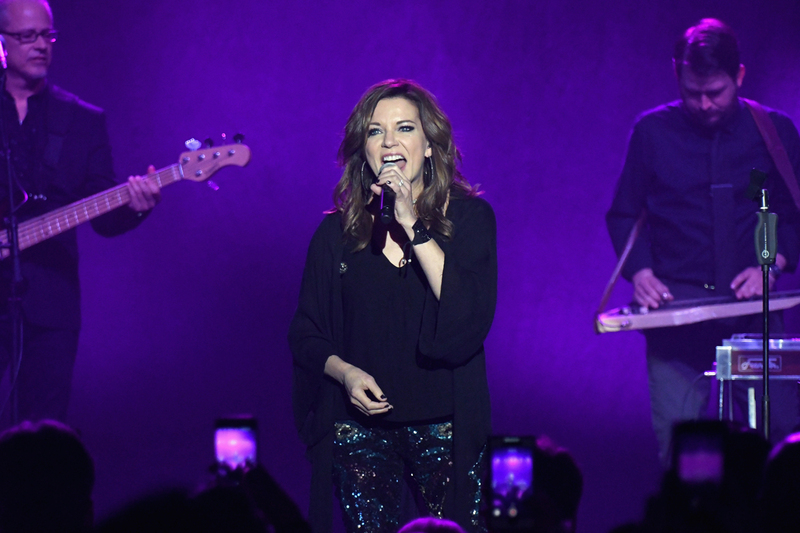 Country music star Martina McBride also closed out the event with a live performance. 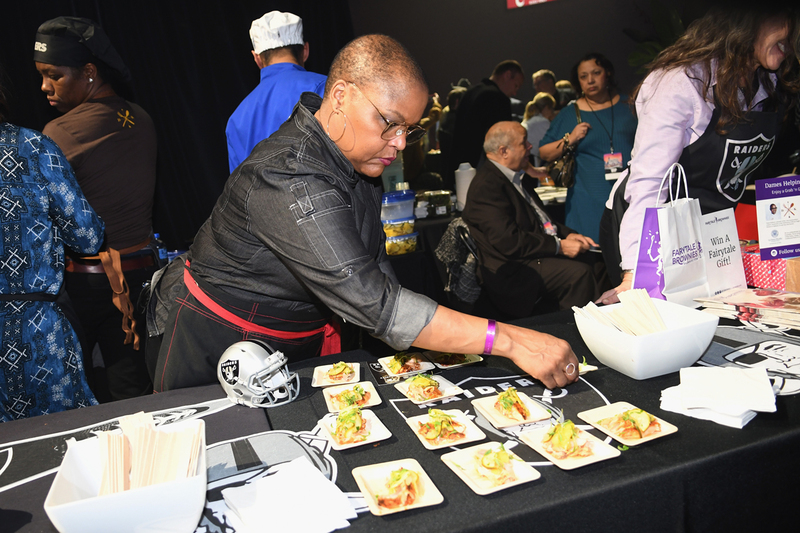 Tickets, which cost $700, allowed visitors to sample dishes from each of the chefs, along with a few guests: the Miami Super Bowl LIV host committee brought mojo chicken tacos from Hell’s Kitchen finalist and Florida chef Paula DeSilva, former NFL player and The Voice contestant Esera Tuaolo whipped up terriyaki smoked salmon with event sponsor Verlasso fish, and the Cobb Galleria’s own chef Nicholas Walker served up roasted pork shoulder. 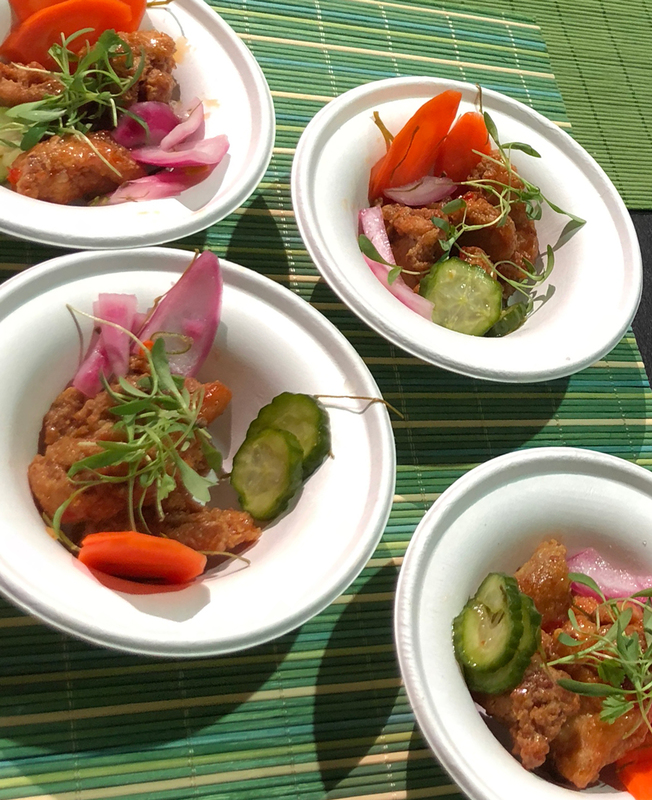 Some of the dishes seemed perfectly themed to the chef’s city—Indianapolis chef Tyler Herald, executive chef at Patachou, Inc., made a creamy sweet corn soup with fried corn; while Houston chef Robert Del Grande of Cafe Annie made a Texas-style chili (i.e. no beans) topped with cornbread. The New York Jets were represented by Nobu chef Taku Sato, who made zuke tuna tataki with jalapeno dressing. Chef Tanya Holland of Brown Sugar Kitchen represented the Oakland Raiders. Former Falcon Chris Draft (far left) and chef Kevin Rathbun (second from left) pose for a photo. But chef Kevin Rathbun had to bring the dish he’s best known for in Atlanta—steak, specifically a roasted NY strip with truffled parsnips and smoked garlic jus. 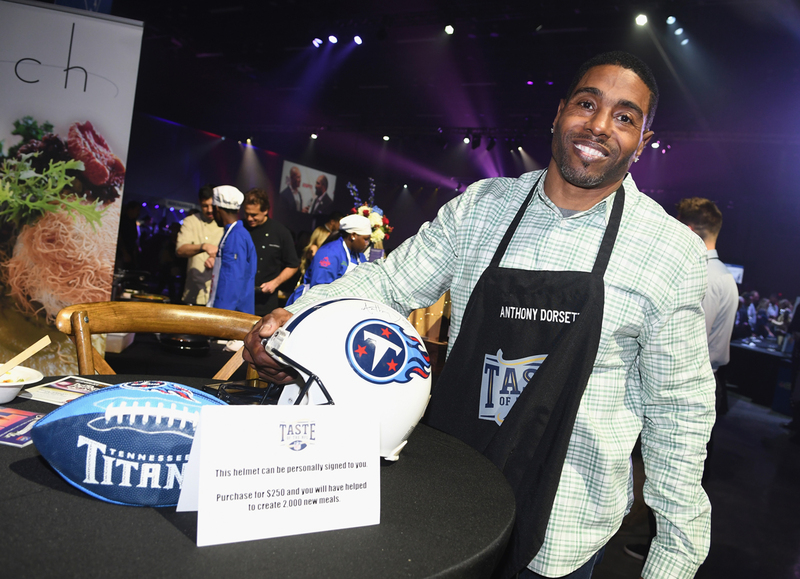 He was joined at his table by former Falcons linebacker Chris Draft. 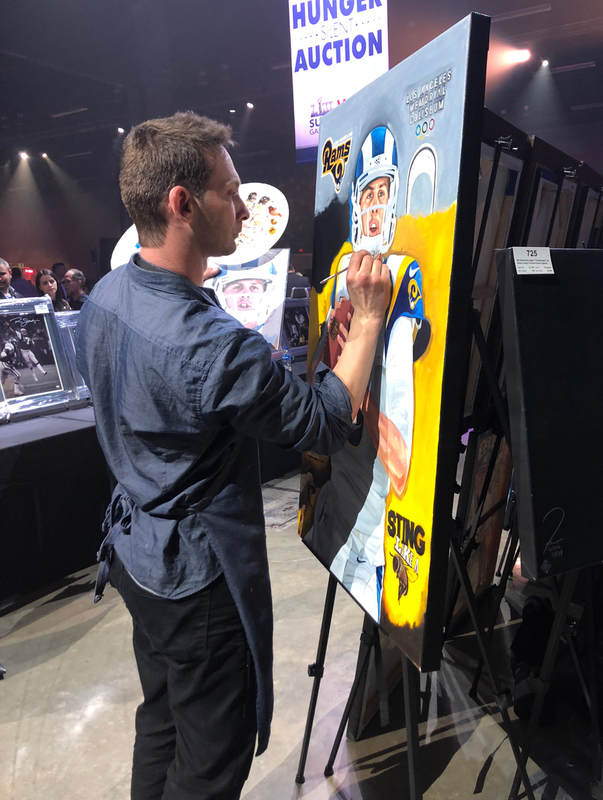 Justyn Farano paints a portrait of Jared Goff during Taste of the NFL. Celebrity host Andrew Zimmern took to the microphone about an hour into the event to remind the guests to buy, buy, buy. 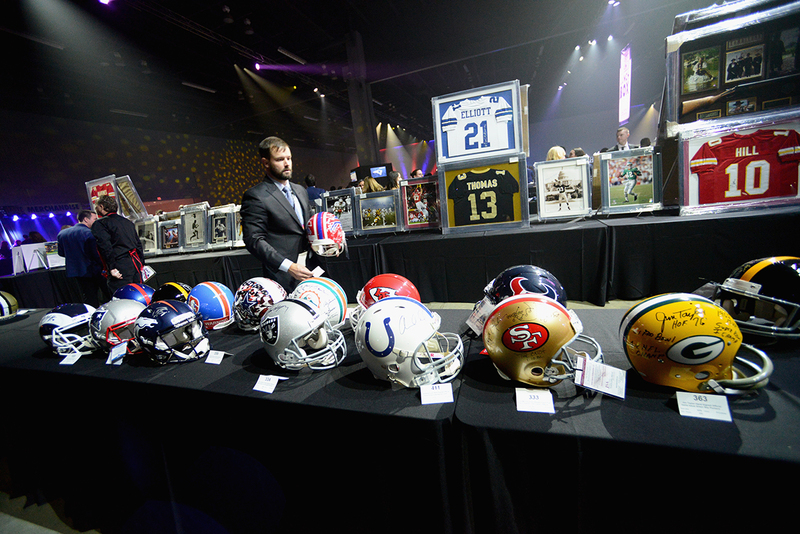 The event featured a silent auction, where one could bid on everything from signed NFL helmets and jerseys to an autographed Darth Vader helmet to original paintings from artist Justyn Farano, who stood nearby painting a portrait of Rams quarterback Jared Goff for much of the evening. Many guests bought footballs from the on-site merchandise tables to collect autographs from the various former players and hall-of-famers to sign, and buying a $100 metal lunchbox (which many also covered with autographs) earned a chance to win a pair of Super Bowl tickets. The net proceeds from the event benefit food banks in each of the host cities (here in Atlanta, it’s Atlanta Community Food Bank). 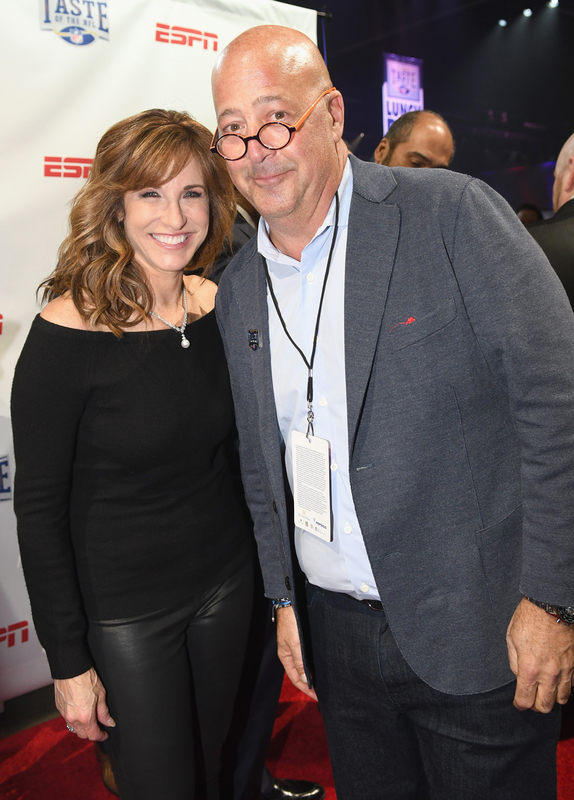 “I don’t think there’s a more important issue in America today than hunger,” said Zimmern said, who has been on the board of directors for Taste of the NFL for the past six years. USDA statistics state that 40 million adults and 6.5 million children lived in households considered “food insecure” in 2017.